I'm honored to be participating in the Around the World Blog Hop today. I was thrilled to be invited by numerous people - about six wonderful ladies emailed to ask me to play along. But the first to ask was Gillian, of Tales from a happy house, who has become a real friend and has always been a great inspiration to me. She lives in Leeds, England with her husband and two children. Sometimes I think she's my alter ego across the sea. I've learned a lot from her and thoroughly enjoyed our friendship and her lovely blog. Thank you to everyone who invited me to participate. This blog hop involves answering several questions. I'm answering them on both my creative process as well as my writing. Both are important to me and I enjoyed thinking about them within the context of the questions posed. So many things. And to be perfectly honest, I don't always feel good about it. Let me explain: I'm the kind of person who likes to concentrate on one thing at a time. I've never been a "magpie" (though I do like shiny things; or maybe that makes me a raccoon?). I actually want to be one of those people who can have several projects on the go, flitting back and forth between them as the mood strikes. But I'm not, at heart, that kind of person. I'm more the type who reads a book she hates all the way through to the end on principal. In school, I used the same pen until it ran out of ink. Sometimes it took several months but I wouldn't give up. Crafting, for me, is often the same way: I need to finish something fully before moving on to the next project, or I feel at loose ends, too scattered to really savor the work. But in recent months, I've decided to let go a little bit and work on more than one project at a time. This has been good and bad for me. Good, in that I can put something down when I'm tired of it and let the inspiration build again. Bad, in that I'm not finishing much of anything lately and I'm even forgetting how to do the work sometimes. I recently found myself referring to a book to make a simple granny square! Sounds inspiring, doesn't it? I don't finish anything and I lose basic skills. On the other hand, I'm able to pick up different projects depending on my mood and I also get to have projects for different settings and circumstances: small, portable ones and great, big lap-covering ones. In the end, it feels okay. I think it's a sign of maturity that I can do this at all, actually; a few years ago, the idea would have made me tearful and panicky. 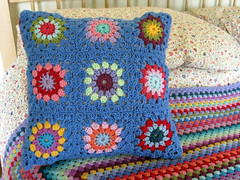 On the crochet front, I'm currently working on a flowers-in-the-snow blanket for my daughter, as well as a ripple throw for my in-laws. I have plans for a crocheted shawl as well as a cowl for myself, to hopefully be worn this winter. I'm also sewing a bit, making a Maggie Rabbit (from a kit) for my daughter too, and working on a patchwork table runner (which just needs binding at this point). Occasionally, I pick up one of my practice knitting swatches, having just mastered the garter stitch this winter (but nothing else yet). I also have several embroidery and machine-sewing projects swirling around in my head at any given time, very few of which have been realized yet. I'd like to work on them before the end of the summer, if possible, but I'm going easy on myself. I've only barely begun to get used to this crafty-promiscuity thing and there's no rush (well, except for the Maggie Rabbit, which has a deadline, as it is a birthday present). This is a difficult question. I'm trying to make my work stand out more. I will say that I've been learning a lot about color and pattern in the past year, and have been finding my own style in that regard. 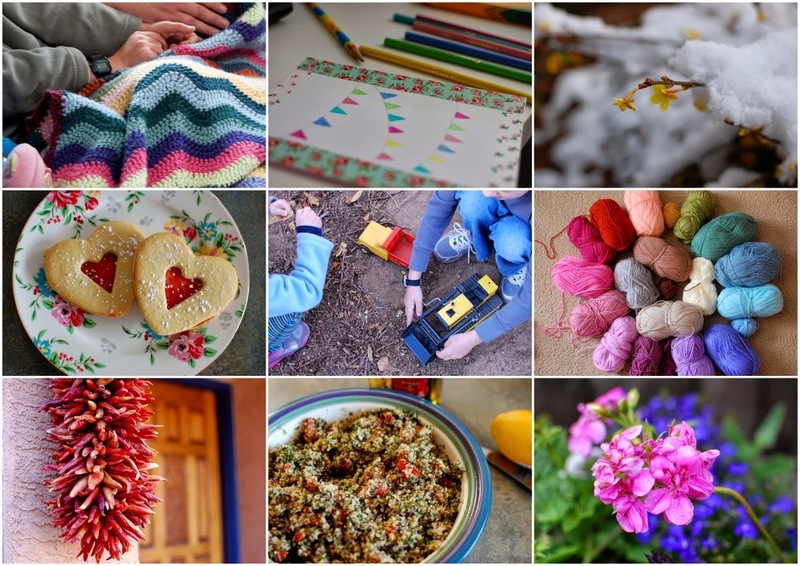 I did lots of sewing, and some crochet, before discovering the world of crafty blogs a few years ago, but I've found it hard to break away from others' ideas of what looks good since immersing myself in blogs. I think I am easily influenced by others' tastes and always have been. I got a "Rachel" haircut in college because everyone else had one, but I never actually liked it. With crochet, I've had to stop and think about my tastes. When I think about what I really love to create, I think of soft colors, simple, clean lines, nothing frilly or overly feminine. I like floral fabrics in small amounts and a few brighter colors mixed in with subtle, muted ones. I don't especially like ditsy prints all over a room, chintz or ruffles. With this in mind, my crochet work especially has evolved as I've embraced my own style. I tend to shy away from using lots of bright colors now, though a couple of years ago, I was all about a bold, rainbow palette. I realized I like grays, browns and blacks, and soft dusty shades of blue, rose and green. I love mustard now! I didn't know I liked it, but mustard and mellow-gold tones really speak to me. I like pink too, I've realized. I hadn't given it a fair chance before. It has taken me a long time to really feel good about my own work. I've never had much self-confidence and I can be very critical of myself, feeling that I'm not good at much. But it's getting better. I think the key has been to stop worrying about what others would think (especially on my blog), and to start making things that suit my tastes and preferences. I appreciated my own creativity more and began finding my own style too. I write what I do because life at home with my family is the most important thing in the world to me. I write from my heart. I have very simple desires, I think. I really care about having a peaceful, productive, intentional life. For me, life at home is about comfort, warmth, doing the things we enjoy and being kind to one another. I also like to write about my hobbies, my environment and places I visit. I find that taking the time to photograph and write about the world around me helps me to enjoy it more. In general, I don't really crave excitement. I love staying home, being comfortable and cozy, cooking our own meals and working on hobbies. I try to bring this to life in my writing, to share (and hopefully make interesting) my own little perspective. I create what I do for all the same reasons. I want this place to be the safest, happiest one my children know. I want them to grow up surrounded by things I made with love and with their needs and tastes in mind. I don't like a fussy home environment. I like a lived-in one, with a few nicer touches here and there, but all of it must be useable and functional. I'm pretty frugal and I love to make things myself, so I try to do that as much as possible. I enjoy seeing the people I love using things I made. I love to look around the house and see my creations and think, "I made that." Mostly, I just love to make things. I'm always working on something and it makes me happy. If there's one thing I hope my children learn from me, it's to find happiness in their own creativity. My writing process starts in my head. I write every minute that I am awake. I've always been this way. As a child, I filled notebook after notebook with observations and ideas, scrawling over the pages with whichever writing utensil was to hand. Now, I'm neater about it, using a pretty notebook which I keep on my desk and pens stored in a crochet-jacketed bean can. I like to make a few notes for blog posts, but generally, I just sit down and start writing. Blogging helps me channel the writing, which sometimes can feel a bit compulsive. Now I have a place to put it all down, with accompanying photos. I've always enjoyed expository writing most of all, and it's a great pleasure for me to write descriptively and in detail about the world around me. I wrote for my school newspapers and was a writing tutor in college, before becoming an English teacher. I particularly loved teaching writing. Blogging has been a formative experience for me as a writer. I enjoy writing on my own and with prompts from others; I am honored to be a member of the Color Collaborative, a group of bloggers who explore a new topic each month through the lens of color, which has been a challenging, thought-provoking and enriching experience. My creative process is similar. 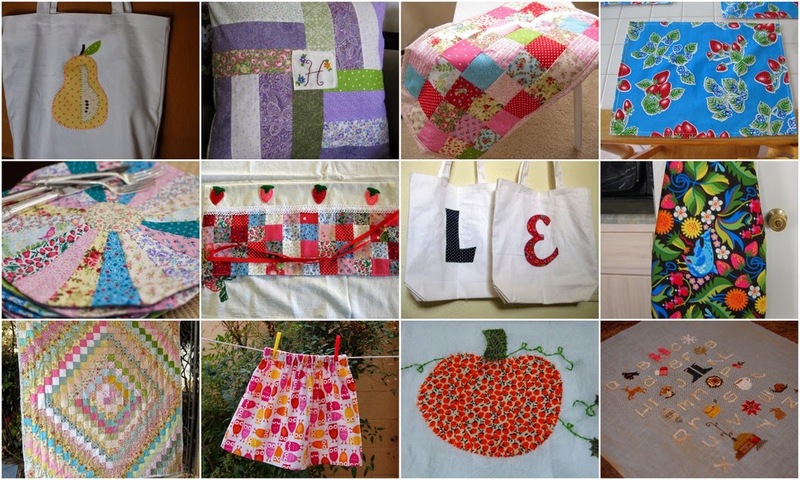 I love to pore over photos of projects and think about ways to personalize them or make them my own. I have a list of things I would like to make, and I make them as it suits me (unless it's a gift with a deadline). I shop for yarn and fabric in a fairly organized way; I'm not one to splurge on supplies unless I have a specific project in mind. I plan colors the old-fashioned way, dumping a pile of yarn on the floor, or stacking bolts on the counter in the fabric store, and playing with them until I like what I see. 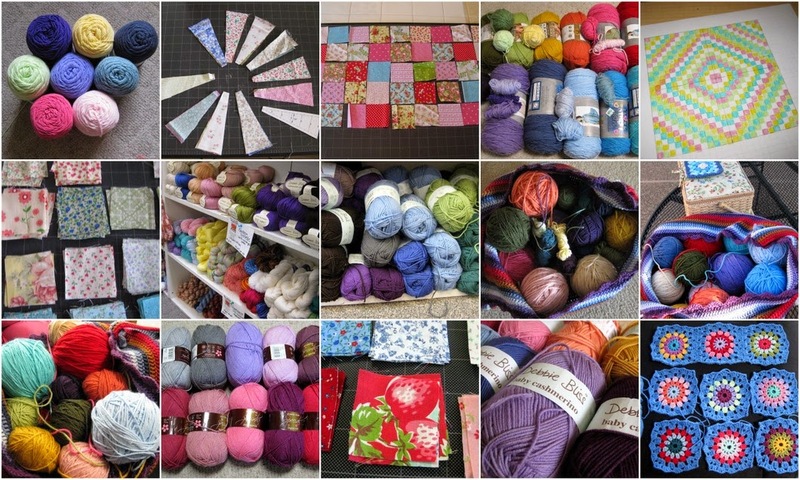 I have a relatively tight crafting budget, as well as limited storage space, so I tend to buy small amounts of supplies and use them up before buying more, but I do have a little stash of fabrics and yarns. Occasionally, I'll start a project on a whim, which feels good. I would like to do this more often. It feels more organic. I am a natural-born planner, but creativity shouldn't always start with a blueprint. It's my great privilege to pass this Blog Hop exercise on to two bloggers whose work I enjoy and admire. I hope you will visit their blogs and read about their creative and/or writing process. I am sure you will love what you see there. If you don't already read their blogs, you'll want to return again and again to see what these talented ladies are up to. They will be posting their blog hop contributions next week, on July 7. Teresa, of the eponymous Teresa Kasner blog, is an artist and yarn-crafter. She lives on a farm in Oregon. She is funny and warm and she shares interesting tidbits of her life on her blog. Teresa is a retiree who is extremely active in her community, holding numerous offices in civic organizations and volunteering often. She is a mother of grown children and a grandmother - a very loving one at that. Her artwork and crafts are beautiful and unique. She is a truly talented and interesting lady and I'm proud to know her. Nicole, of My Garden Diaries, is a mom of three small children who is passionate about gardening and home design. Nicole lives in Illinois. I am always very impressed at how beautifully she puts together her home and garden, in addition to being a very devoted mother. Nicole and I are about the same age and I feel that she really "gets" me, especially when I mention things I liked as a kid or teenager. Nicole's blog is truly inspiring; I get new ideas from her all the time. And she's always sweet and supportive. She is the best kind of blogging friend. Blooming miraculous! I am so pleased to report that my small backyard planter of annuals are still alive, and even thriving, nearly two months after planting them. I've been keeping notes and taking progress photos all along, and as I did at the end of May, documenting their growth as we've moved through the month of June. Perhaps this beginner's gardening series is only interesting to me, but as I've written about my planting woes in the past, I'm really excited to share the success I've been having this time around. This is how they looked on May 4, when I planted them. There are two fewer petunias and one less verbena now; they may have been crowded and weren't growing well. But the rest of the plants remain. ❀ June 6 - the planter is filling in and some plants, like the geranium at the right, are beginning to spill over the sides a little. I've continued giving the plants Miracle-Gro every two weeks, and they've had their most recent dose on June 1. Unfortunately, I've been noticing damage to some of the petunia flowers. It turned out to be caused by small green caterpillars who were eating them. I could tell there was something in there because I saw droppings, like tiny black poppy seeds, all over the petunias' leaves. I picked off any caterpillars I could see. I don't like using pesticides around my children, nor do I feel it's a good idea with chickens in the yard now. So I have picked the caterpillars off the plants whenever I see one. There haven't been very many, and as soon as they're removed, the petunias flower again quickly. It's very hot and dry right now and I've been watering the plants every morning. They get a good soak with the "shower" setting on the hose-sprayer. They also get some water from the drip-hose, connected to our irrigation system, which I've placed in the center of the planter. They're growing well! I'm relieved and happy to have success finally. ❀ June 13 - after about a week without petunia flowers, there are buds finally emerging. You can see a dark purple one at the left side of the planter, along the top edge. The caterpillars ate every petunia and they did it so quickly! I was annoyed. But I think it's under control now. We haven't had any rain in several weeks and I don't want to be wasteful with water, so I've been using any water we have standing, whether it's from the kids' playing or leftover from cooking (when possible). I don't think the plants mind where the water comes from, as long as they get some. The verbenas, geraniums and lobelias are doing especially well. They don't seem to be attractive to the caterpillars. I'm so glad they didn't eat all my flowers. ❀ June 21 - my plants survived while I was away on our trip to California! They were watered by the Bear's parents while we were gone. They had to come over to care for the chickens and they also watered my plants for me. The plants grew a lot in just a few days. I think they said there was a tiny bit of rain on one of the afternoons. The petunias have flowers again, you can see dark pink ones at the center of the planter. I haven't seen any more caterpillars lately. I forgot a Miracle-Gro watering, which they should have had on June 15. I will give it tomorrow, the 22nd. I do think it helps. I'm sure the main feature of these plants' success has been just plain old watering, but I think the partial shade back here (especially in the morning through mid-day, when the sun is strongest) and the fertilizing have helped too. Both geraniums are very prolific, and I'm getting better at deadheading them before they look really terrible. I think the more you deadhead, the more they must put forth new growth because it's never-ending. I love it. The verbenas have gotten very lush, and they put out new flowers every day. The lobelia remains my favorite, though. I like to comb through it with my fingers after it's dried from the morning watering, to make the flowers stand up thick and lush again. The daily waterings continue and they'll get another feeding with Miracle-Gro next weekend. I can't believe I've got nearly two months of care invested in these plants already and that they're doing so well. I'm determined to keep it going for the rest of the summer. Can I do it? I hope so. ❀ For July - the monsoon should start up very soon. It looks, from the extended weather forecasts, like we're going to have above-average precipitation in July. I so hope this is the case! I love rainy days and thunderstorms anyway, but if they help my plants grow, so much the better. In the shorter term, there is rain in the forecast for the coming week and they think the monsoon pattern will get "fired up" this week too, hopefully leading to good storms. YAY. I will continue watering some every day unless there is major rain, and fertilizing every two weeks. I hope there won't be too much hail with the potential future storms, but its always a possibility. I could maybe hang a tarp? We'll see. For now, I'm just looking forward to the change in the weather and the good things it can do for my plants. July is often the month when the flea beetles really get going around here. I hope they stay far away. I'll use the dish-soap-and-water solution if I see any. I'm starting to really enjoy gardening, and not just the old-growth stuff someone else planted before I got here! How are your annuals doing now, if you plant them? Linking in with Helen's End of Month View series. 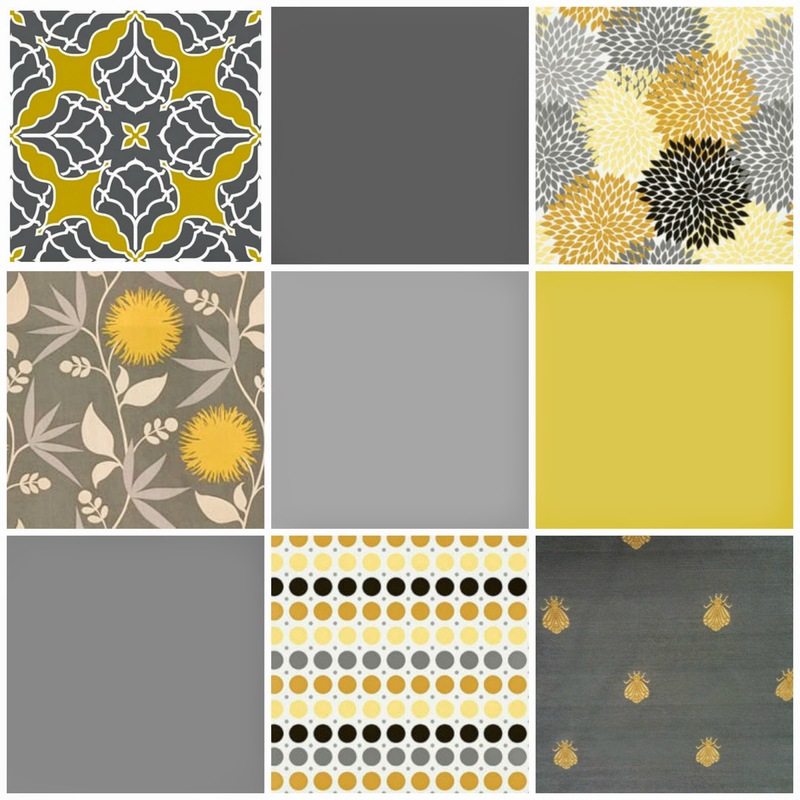 My birthday is gold and gray. I was born on a rainy Thanksgiving morning in Atlanta, Georgia. The weather was truly terrible, I'm told. My parents had gone to the hospital the night before; I was their first baby and they weren't sure about my mother's "gas pain" but they figured it was a good idea to get it checked out, especially since I wasn't due for another three weeks or so. It was no gas pain, though. I really was on my way. My father was not allowed to stay while my mother labored; this was the 1970's, but things were old-fashioned at the oldest hospital in Atlanta. He ended up taking a walk in the neighborhood, the rain soon driving him indoors for something hot to drink - at a lunch counter where some guy offered to sell him a gun. He declined, and went back to the hospital, where I was soon born. The rain continued. Nobody else gave birth in the hospital that day; my parents were given a cafeteria-made Thanksgiving dinner. While they ate, they came up with a new name for me, the original slightly Christmas-y one no longer appropriate. My birthday brings a comforting sameness, always falling on or near the holiday. My birthday is turkey dinner, in some stage of being prepared, eaten or recovered from. It's "Alice's Restaurant" and "The Wreck of the Edmund Fitzgerald" played on a Sony turntable - mood music for gusty November. It's the Macy's parade on TV and the scent of sauteed celery and onions permeating the house. It's almost never a school or work day. It's people of all ages asking, "Hey, wasn't that the date of JFK's assassination?" (It's one day later). It's a real birthday cake even when it would be easier to stick a candle in a pumpkin pie. It's pumpkin pie and birthday cake, no questions asked, if I feel like having both. Weather-wise, my born-day seems to have set the precedent for my birthday ever after. I've spent my birthday in several parts of this country and it has almost always rained, or been dismal and dark, or even snowy on my birthday. I was not born at a delightful time of year. Late November is dreary and wet in many places. It's brisk, too; my birthday is often one of those blustery, chilly days when clouds scud across the sky, sunshine peeking out weakly from time to time. You need a jacket. You might even need a hat or a scarf. You certainly need a hot beverage; for me, it's milky tea sipped from a thermos bottle as the clouds gather and loom. If you're like me, you've been watching the sky for months, sky-watching being a pastime which picks up in urgency as the weather cools down and becomes more temperamental. Late fall is one of the best times to watch the sky, and I always do it on my birthday. Where there is gray on my birthday, there is also gold. November's birthstone is the topaz. It's found in many colors, including gray, but November is symbolized by the golden-orange variety. Topaz is hard, almost as hard as diamonds. Its colors come from impurities within the crystals making up its structure. Topaz, to me, is rougher and less refined than other birthstones. It has neither the brilliant primary colors of rubies or sapphires, nor the cool tones of peridots or aquamarines. It's like November itself, I think: crisp and raw. I have often been given topaz jewelry for my birthday, always set in yellow gold. I received my first piece, a ring with a heart-shaped golden glass jewel, for my sixth birthday. Later, my parents gave me heart-shaped real topaz earrings (my thirteenth), a ring with a pear-shaped topaz and two tiny diamonds (my sixteenth), a pear-shaped pendant on a slim gold chain (my twenty-first). I don't wear them often today, but I treasure them. My topaz jewelry reminds me of birthdays past - the peculiar, bittersweet condition of being born on a major holiday, of having real jewelry all my own and of learning to appreciate November's rusty gemstone. Golden, too, is the landscape in late November, when the trees are completing their autumnal transformation. Leaves are falling from the trees, gathering in the roof-gutters, skittering across streets. Grasses are yellowing and curling, dry and crisp on the ground. Many of my childhood birthdays, and some of my adulthood ones, were spent in the northeast, where the trees were nearly bare by late November, black branches clawing leaden skies. Now my birthdays are spent in the southwestern desert. By my birthday, the trees' colors are fading but most leaves remain. The colors look brighter against a stormy sky. Last year, in late afternoon on the day before my birthday, I stood at the back garden wall, gazing up the arroyo. The sun shone for the first time all day, casting bright rays eastward toward the mountain, lighting up the trees. They glowed in the gloom, flashes of ocher, chartreuse and burnt orange. The sky beyond was dark and forbidding, slate-gray with bits of cobalt between the shifting clouds. By morning, it was snowing. We built a fire. Outside, the leaves shone through the falling snow. It was another gold-and-gray birthday. Happy first birthday to the Color Collaborative! Many happy returns. I've thoroughly enjoyed working with this group of ladies over the past several months. 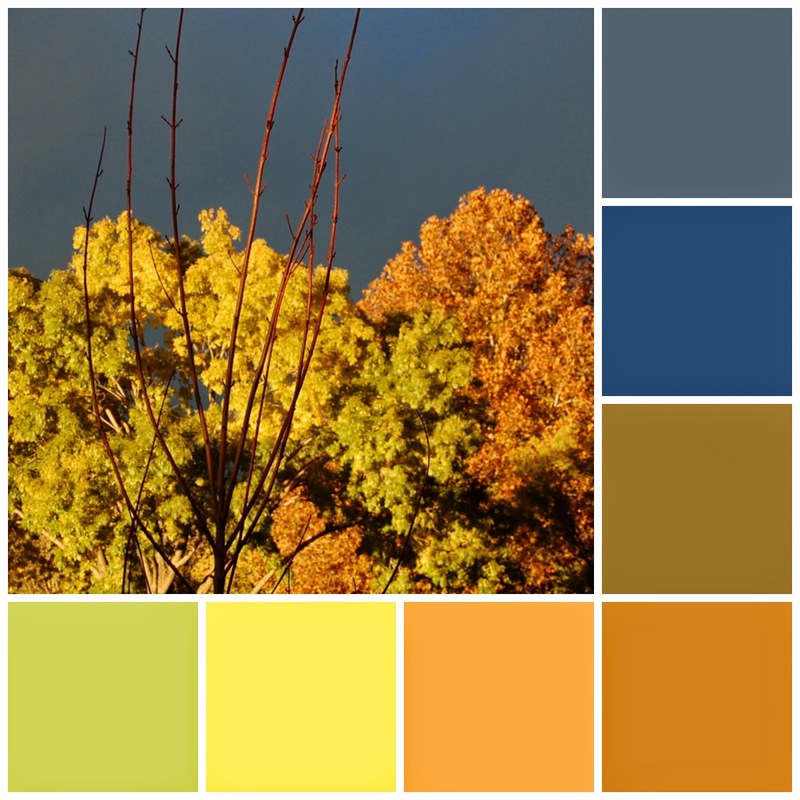 If you'd like to read more of my Color Collaborative posts, click here, or use the button I've installed on my sidebar. Thanks for reading and supporting our creative blogging endeavors. Fabric photos in first collage are from Etsy. 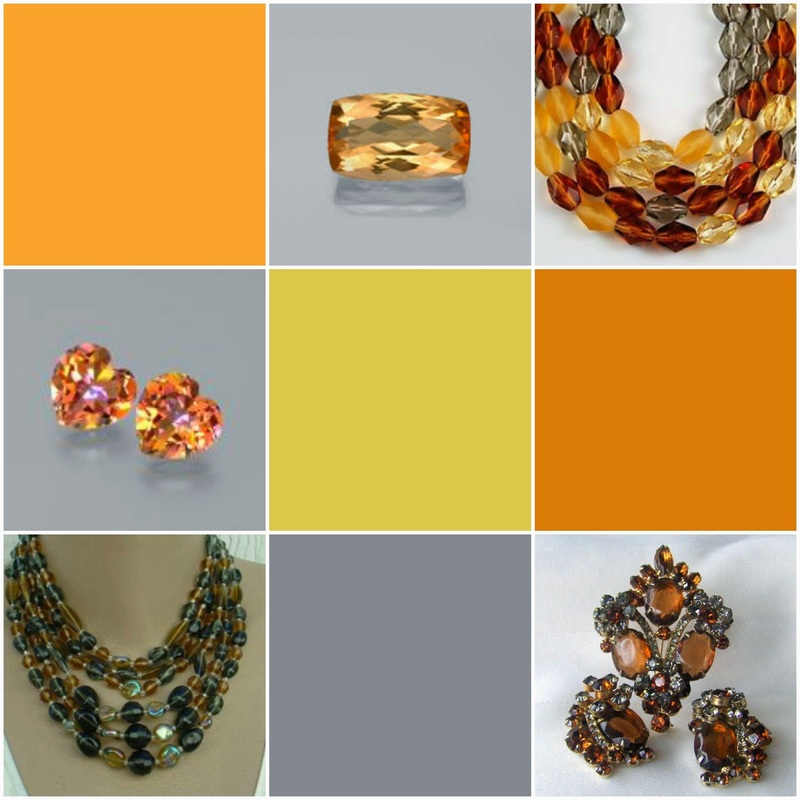 Topaz jewelry photos in second collage are from Pinterest, Etsy and gemstone information websites. Trees photo in third collage is my own. Gillian at Tales from a happy house. What is The Color Collaborative? All creative bloggers make stuff, gather stuff, shape stuff, and share stuff. Mostly they work on their own, but what happens when a group of them work together? Is a creative collaboration greater than the sum of its parts? We think so and we hope you will too. We'll each be offering our own monthly take on a color related theme, and hoping that in combination our ideas will encourage us, and perhaps you, to think about color in new ways. At the end of a long day alone with my children, after I'd gotten the littler one to bed and the bigger one supposedly attending to his dental hygiene, I stopped and looked around. The place was kind of a mess, the mandated daily toy-pickup event having been rather haphazard this time. I was tired and so were they. Our day was not very good. This morning's trip to Target was fraught with squabbles over juice-box flavors and complaints about the air conditioning (it was blowing pretty hard, I have to admit). Lunchtime brought more disagreement; apparently, the meatballs in our canned Italian Wedding soup were distributed unevenly. The afternoon was long and boring, it being too hot to play outdoors. I decided to go to McDonald's for dinner, out of sheer laziness. They thought it was a treat. There was more arguing there; someone threw someone else's Happy Meal toy down the twisty slide and that wasn't fair. I played Solitaire on my phone and tried to tune them out. We came home and they went to bed and now I'm decompressing. It's a long day when you're doing it all by yourself, and I'm thankful that it's not the usual situation for me. We'll clean up some more tomorrow. It's looking a little bomb-shelterish right now, but that's okay. In fact, I sort of enjoy it when this happens; I like to see what they've been up to. It's never very neat around here anyway. Their things are in every corner of the house; toys and books turn up in our bedroom sometimes too. They're mostly free to play where they like, and they spread out very efficiently. They didn't clean up particularly well, but the basics are covered. Lego has been shoveled into a corner of the family room, books and papers are piled somewhat neatly on various tables, they put their bikes and riding vehicles on or near the patio, as requested. It's not so bad. But there are reminders of them everywhere I look. I think it's a sign that they are happy and comfortable here. I like to think so, anyway. Our home is lived in. Sometimes, I look longingly at home-decor blogs or online stores, wishing I could have fancy new things which haven't been pounded on with sippy cups or spilled on or had mouths or noses wiped on them. I don't have a showy home. I probably never will. Most of our things were old before we got them, by way of the Salvation Army or roadside throwaway heaps. We got a beautiful coffee table out of an apartment-complex dumpster once; we took it home and refinished it and we're still using it 15 years later. I look around myself and every piece is a memory: the rocking chair where I nursed my babies, the homeschool cart which has been, at various times, a liquor cabinet, microwave stand, baby changing table and rolling bookmobile, the aforementioned coffee table which we rub with Johnson's paste wax every few weeks to keep it shiny. We live here, all four of us. We laugh and cry, eat and create, live and love. The Bear and I are home from our little getaway to San Francisco. We had a lovely time! We left early on Tuesday morning. The small Bears stayed with my in-laws, starting on Monday night so that we could leave the house bright and early. We had a direct flight from Albuquerque to Oakland, across the Bay from San Francisco. We were using the Bear's mileage rewards on Southwest Airlines; he travels a fair amount for work and we decided to take advantage of the rewards for ourselves. He also had some hotel and car-rental rewards, so it was quite an affordable trip. In San Francisco, we spent three nights at the Cow Hollow Motor Inn, which was recommended by my blogging friend, Carol, and it was a great place to stay. This hotel is on Lombard Street, which is one of the most famous streets in the city. This street has a section of hairpin turns, zigzag-shaped, on a very steep hill. We were a few blocks from that famous stretch, though, in a bustling neighborhood that had both commercial and residential elements. On a vacation, I like to try living like a local, either staying in a rental property or in a hotel that is situated where the people really live. Obviously, it's still mostly being a tourist, but it's interesting to eat in the local restaurants, visit the stores, have coffee in the neighborhood cafe, walk up and down the blocks looking at the houses...it's a lot of fun for me. This neighborhood was no exception; we could walk one block down the street from our hotel to a shopping strip on a side street. Here, we had good coffee and tea, delicious pizza, sandwiches and ice cream and even did a little shopping. Nothing too fancy; I grabbed something in the tiny Walgreens and poked around in a few shops without buying anything. One of them was Paper Source, which I'd never visited before. Oh my goodness, what a store! I could have spent all day on the paper display-wall alone. And the stationery, the ink-stamps, the washi tape! The Bear likes this kind of stuff too and we didn't want to leave. The best part of staying near the residential neighborhood was the chance to walk around and check out the houses. We did the same thing the last time we were in San Francisco, almost ten years ago. I'm sure we couldn't afford to live there, but the architecture captures my imagination. We did lots of touristy things too, including a long meander through Golden Gate Park, where I especially enjoyed the beautiful, well-tended Rose Garden as well as open meadow spaces full of tiny daisies and buttercups. We visited the de Young Museum, which was fantastic. My favorite area was the Department of Textile Arts. It was amazing. I think I'll write more about it another time, but suffice it to say it was exactly my bag. They currently have a breathtaking exhibit on lace. Just lace, through the ages and made by many different cultures. We also visited Chinatown, which is always an interesting experience. There are so many little shops to duck into. Having been there before, I was a little choosier about shops, since they all seem to sell the same kinds of things. But they're surprising too; it's interesting to see cheap tchotchkes alongside majorly expensive items. I bought a tiny plastic Buddha statue for 99 cents, to put in our printer's tray display in the living room. We ate lunch in a dim sum restaurant. I'd never had dim sum before, but it was fun! Chinatown is really pretty. It's color and noise all around you. We spent a whole day on the Fisherman's Wharf. We visited the Ferry Marketplace in the morning, taking in the farmer's market and all the stands selling locally-grown produce, meats and cheeses, baked goods and prepared foods like tacos and barbecue. We ate a good sandwich with cured Italian meats and shared an ice cream cone and two exquisite macarons. Then we started walking: we wanted to see the rest of the Wharf over the course of the day, before making our way back down to board the boat to Alcatraz Island in early evening. I'd seen the Wharf before, on that other trip years ago, but only the northern end, near the Ghirardelli building. The Wharf is a lot longer than I'd realized! We walked and walked and walked. We ate more too; dinner was clam chowder in a sourdough bread-bowl at Alioto's, with a snack or two along the way. Hey, it was a long day and we marched for hours. The tour of Alcatraz was really interesting. I had no idea what to expect but it was the perfect combination of history and spookiness. We had a rare opportunity to explore the uppermost floor of the prison, which was once the inmate hospital. Believe me when I tell you that this place was scary. They still have some primitive-looking equipment up there, the (lead-based) paint is peeling off the walls, the windowpanes are broken out in many places with the wind howling through them. Yikes...I'm getting all shivery just writing about it. I recommend it highly, though. It was incredibly fascinating and well worth the ticket price. We drove back across the bridge to Oakland on Friday morning, staying there overnight to be near the airport. I tentatively suggested seeing whether they had an IKEA store in the area. I'd never been to one and I've been dying to go for years now. I thought he'd laugh, but the Bear was completely on board. And thus, I visited IKEA for the first time. I can't believe that place! Up until this point, I'd only bought my little 99-cent plastic Buddha as a souvenir for myself, in addition to small gifts for the children from Chinatown. You'll think I'm crazy, but my souvenirs mostly came from IKEA. I only bought things I could easily pack in my travel bag. I'll have to show you another time, and share more of my impressions of this fabulous store. All of you with IKEA stores in close proximity have my undying envy. The laundry is almost done, the kids are settling back in at home (they were only two blocks away and came back every morning for chicken duty, but I think they missed their beds), and I've already hit the grocery store. I missed my small Bears. We're having a quiet day at home together before the Bear needs to travel for work again this week. I'm so glad we were able to reap a benefit of his work-travel by having a nice little trip, just the two of us. It was wonderful to be mostly off the clock - sleeping in, eating when we were hungry, free to come and go in the evenings. I loved talking over coffee, sharing small plates of food, walking hand-in-hand, laughing a lot. I love him so very much. Oh, I just love to ripple. Do you love it too? When I work on this project, a throw for my in-laws to use in their new house, I'm completely in the Ripple Zone. Do you experience the Ripple Zone? It's a mindset, a mood, a mathematical system of relaxation and enjoyment: one-two-three-four-double-double-one-two-three-four-double-together-double-together-one-two-three-four...and so forth, straight on down the line. Up and down and up and down and up and down again, mountain to valley to mountain to valley. I appreciate all the nice things you said about my ripple in my last post. I thought I'd share a few more photos of it. 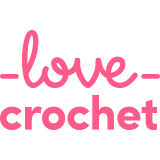 I'm crocheting it with Attic 24's Neat Ripple Pattern. 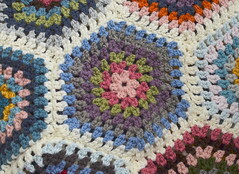 This popular pattern is easy to follow and it creates a beautiful, solid ripple design. I love open ripple patterns too, but I think this one makes an especially warm blanket. This is my third blanket made in the Neat Ripple pattern, actually. My first was also my first major crochet project a couple of years ago, when I became serious about improving my crochet skills. I made a queen bed-sized blanket in pretty crazy colors, still learning about color palettes at the time. My palette for that blanket ran the gamut from baby pink and yellow to deep burgundy and rust, with hot pink and periwinkle and pistachio green in between! It was eclectic. My second ripple was a baby-sized one made for a friend's new daughter last year. That time, I did a little better with the colors as well as the pattern - there were no mistakes. Every stitch was right. I was really proud. This time around, for my third Neat Ripple, I feel really comfortable with both the pattern and my color selections. I really love the way these colors look together. I wanted soft colors, in a desert-like palette, and I think I've got them. My in-laws' home is done in a lot of neutral tones - taupes, beiges, browns - and the colors here will spice things up without being too bold or bright. I'm using Caron Simply Soft, with a size H Susan Bates hook. This is my first blanket made with Simply Soft and I'm happy with it so far. It's nice to work with - soft, not too splitty, very few knots or gnarly bits flying off as I work. I'm using five shades - Light Country Peach, Persimmon, Cream, Bone and Pistachio. I'm working with a set color pattern, as you can see. I find random colors to be a little less relaxing than proscribed ones, but I'm keeping it interesting with the way I've grouped them. It's earthy, wavy and soft. I've been thinking about names for this blanket, since I often name the blankets I make. I think this one will be known as Desert Waves. My in-laws live on a cliff overlooking the Pacific Ocean at their permanent home in New Zealand, and they live in the high mountain desert here in New Mexico. They split their time between the desert and the seaside, what a wonderful contrast. 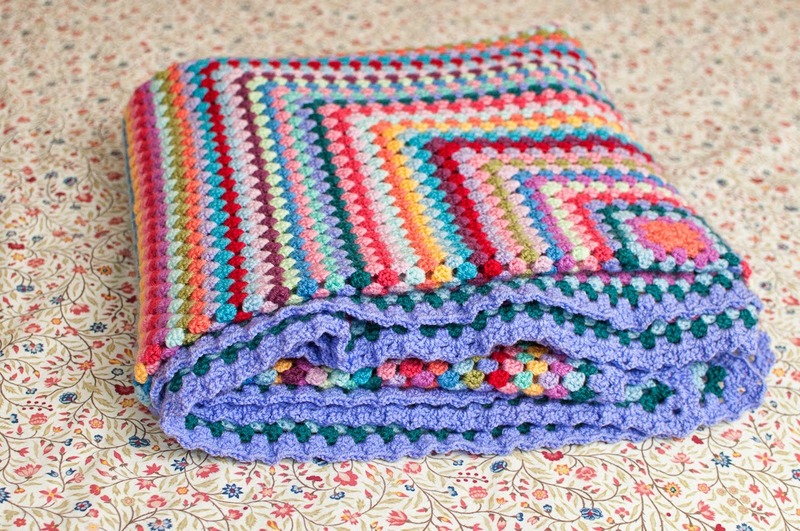 I like the idea of combining the features of both in this ripply little blanket. I'm taking a blogging break for the next several days. I'll be on a little getaway with an adorable guy. See you soon!